For four months, from November 1, 2013 through February 28, 2014, the Media Research Center…analyzed nearly 1,000 U.S. and international issue- oriented news stories aired on the flagship weekday evening newscasts of Univision and Telemundo (Noticiero Univision and Noticiero Telemundo). This study found a marked leftward tilt in both of the networks’ news coverage, particularly in reporting U.S. domestic policy news, with Democratic, left-leaning sources overwhelmingly dominating U.S. coverage. In international news, however, both networks maintained a more critical and/or balanced stance in relation to governments in the region, as is the journalistic norm. Out of 667 stories on U.S. domestic policy, more than six times as many tilted left/liberal (300 or 45%) as slanted in a right/conservative direction (43, or 6%). The remaining 324 stories (49%) presented a balanced or neutral discussion of U.S. policy. In coverage of U.S. domestic policy (667 stories), Democratic politicians and spokespeople for left-leaning/liberal advocacy organizations such as the ACLU, National Council of La Raza and various labor organizations were quoted nearly three times as often as Republican politicians and spokespeople for conservative counterpart organizations such as the Latino Partnership for Conservative Principles, the Heritage Foundation and the LIBRE Initiative (1,011 to 370 appearances and/or direct quotations) on Univision and Telemundo newscasts. The top three U.S. domestic policy topics covered by both newscasts were immigration law enforcement, immigration reform legislation in Congress and ObamaCare. 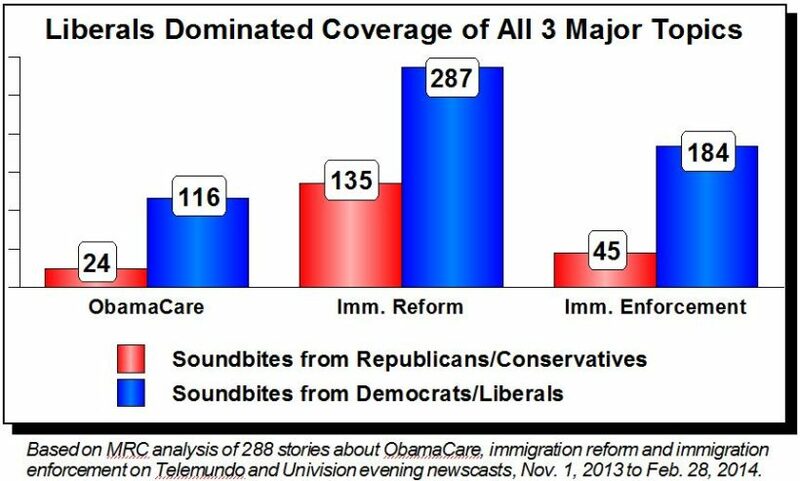 The majority (170, or 59%) of Univision and Telemundo’s 288 stories on these three issues tilted left/liberal. Only 21 stories (7%) tilted towards the right/conservative, while the 97 remaining stories were neutral or balanced. Despite ObamaCare’s problem-plagued rollout and controversial implementation, Univision and Telemundo reporting featured advocates of ObamaCare over its conservative opponents by a margin of nearly five-to-one (116-24). On the subject of immigration reform, Democrats and spokespeople aligned with left-leaning pro-reform organizations made well more than twice as many appearances as conservatives and Republicans (287-135). In news related to immigration law enforcement, the ratios were also lopsided, with Democrats and advocates for more liberal immigration law enforcement policy appearing four times as often as conservatives and law enforcement officers combined (184 to 45). On the other hand, Univision and Telemundo’s coverage of Venezuela’s socialist government was decidedly critical, with 39 of the stories about the situation in Venezuela favoring anti-government protestors, while just one tilted in favor of the government. Soundbites heavily favored the opposition by a two-to-one margin (154 vs. 73). The majority of both networks’ coverage of the Catholic Church was favorable, as 49 of the 95 stories (52%) favored the Church, compared with 30 (31%) neutral/balanced and 16 (17%) that tilted against the Church. Talking heads in these stories were mostly prelates or other pro-Catholic sources, who outnumbered critics by a greater than three-to-one margin (145 to 40). …Our [analysis] shows America’s top Spanish-language news networks are failing to fully live up to their journalistic vocation when they let their [national] news content be dominated by partisans on one side of the ideological spectrum. … Just like the rest of America’s news consumers, viewers of U.S. Spanish-language networks deserve news coverage that is comprehensive, fair and accurate, adhering to the highest standards of journalistic integrity. How might Univision and Telemundo’s slanted reporting on domestic issues affect the viewpoint of their Spanish speaking viewers? If Univision and Telemundo were a person’s main sources for news (especially for those American voters who only speak Spanish), the slanted reporting on domestic issues would cause them to unknowingly view domestic issues through a distorted lens and affect the way these viewers vote, instead of giving them a balanced view of the news.